2. Pressure cook with 1/4 cup of water for 1 whistle. 3. Heat Oil in a pan, splutter mustard seeds, add curry leaves, Red chillies and chopped onion and fry until it turns golden brown. 4. 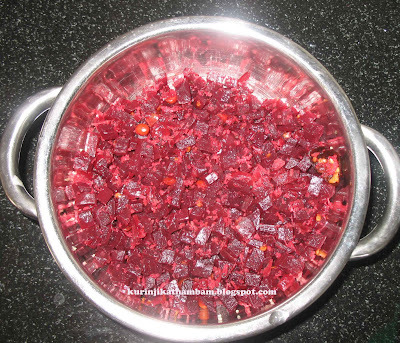 Then add boiled Beetroot with water and salt. 5. Fry until the water evaporate. 6. Finally add the grated coconut to it and fry for 3 mins. I love the way you made this poriyal. Its my fav. But my husband doesn't like it. So i dont make it here. yours looks delicious. Easy delicious colorful healthy Poriyal. This is such a wonderful & yummy way to have beetroot. This is a very new recipe & dish for me:) Thanks for sharing!!! sambhar onion n beetroot ---yum! So colorful..nice way to eat beetroots! Simply superb poriyal ...Love the color..